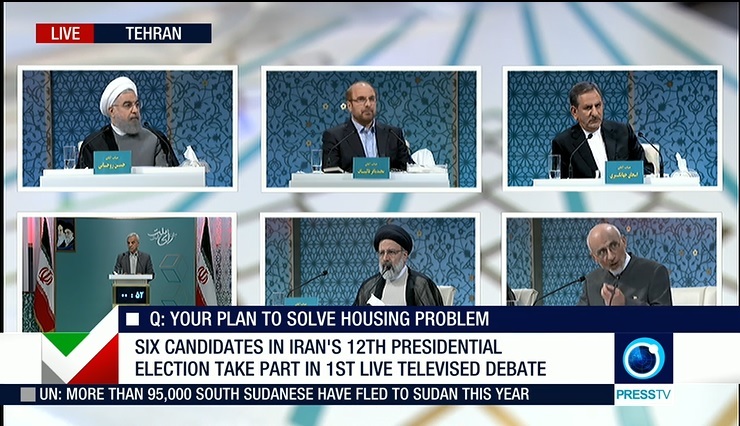 On April 28, the six candidates vying for Iran’s presidency engaged in a fiery first debate. 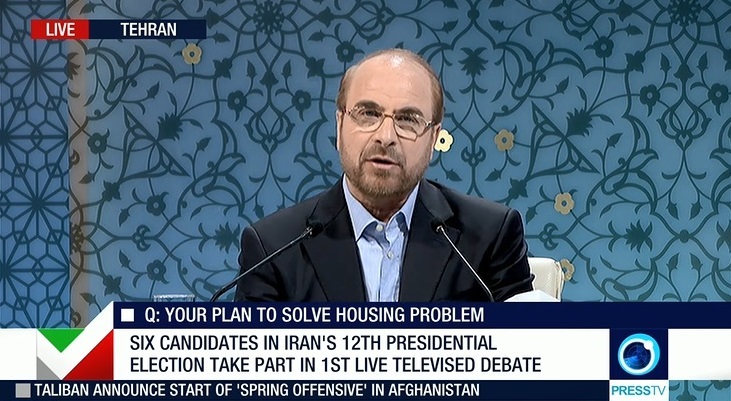 Tehran mayor Mohammad Bagher Qalibaf challenged President Hassan Rouhani’s economic record. “You are the government of the four percent,” Qalibaf told Rouhani, accusing the president of working to benefit Iran's elite. Qalibaf also said the government has not helped Tehran enough and that officials need to get out of their offices and observe how regular people live. The incumbent responded forcefully to Qalibaf’s accusations, saying that the mayor issued building permits to the wealthy. One of the most heated exchanges was over Qalibaf’s claim that Rouhani promised to create 4 million jobs. Rouhani denied this and called his opponent a liar. 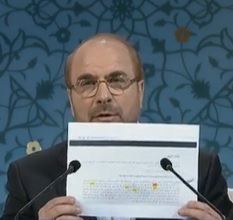 Qalibaf held up a printed page from Rouhani’s website as evidence. Rouhani said his statement was taken out of context and that he said an influx of 10 million tourists could create four million jobs. The three-hour program focused on socioeconomic issues and was broadcast live on state television. The moderator posed questions on topics ranging from the wealth gap, obstacles to young couples marrying, housing shortages, government red tape, women’s employment, and more. Rouhani appeared cool and confident, except for a few exchanges with Qalibaf. Rouhani spent much of the debate citing his government’s achievements and defending his record. But his vice president, Eshaq Jahangiri, played a more offensive role as a wingman. 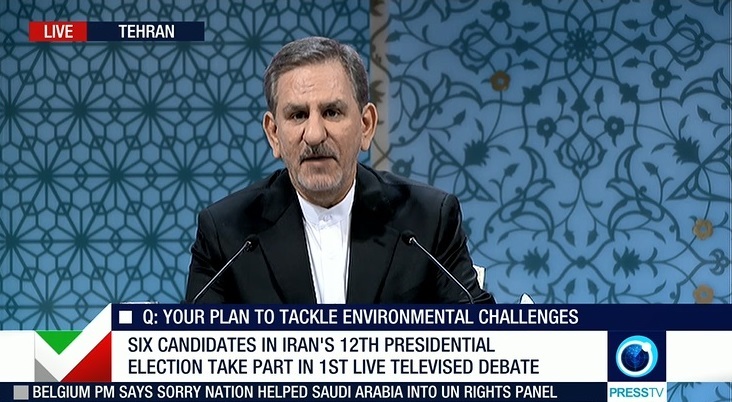 Jahangiri insinuated that Qalibaf’s supporters attacked the Saudi Embassy in Tehran in January 2016, which he alleged made tourists and foreign investors hesitant to visit Iran. Jahangiri said that Qalibaf does not have much to show after 12 years of mayor, except construction. 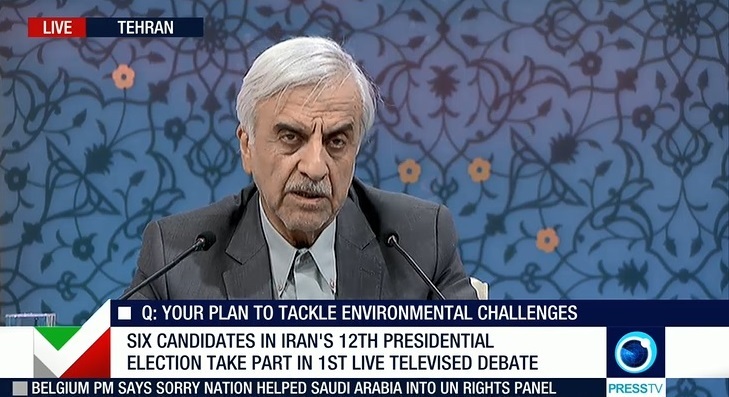 He criticized for Qalibaf for “speaking like he is in charge of the country” and rhetorically asked why the municipality had not yet managed to separate garbage for recycling. In another jab, Jahangiri referred to the January 2017 collapse of the Plasco high-rise building that left some 30 dead. Many Tehran residents held Qalibaf responsible and some called for his resignation. Jahangiri said that he would apologize to the Iranian nation whenever needed. Jahangiri also accused Qalibaf of creating security forces that beat-up street salesmen. Qalibaf, on the other hand, questioned Jahangiri’s candidacy. 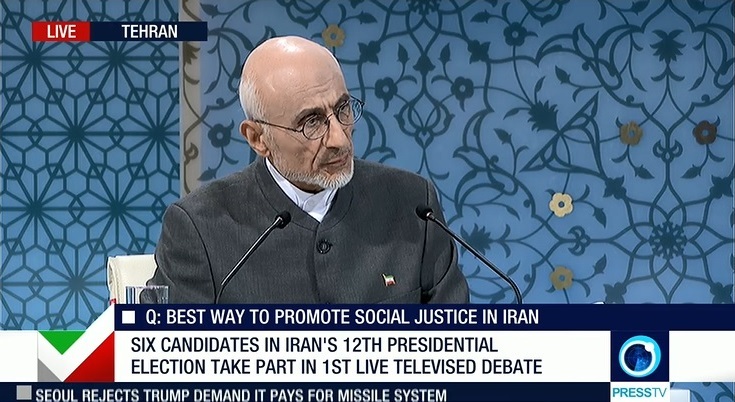 He accused him of being a surrogate of Rouhani and said his participation was taking time away from the other candidates. Jahangiri is widely expected to withdraw before the election in favor of Rouhani. But he said that he is ready to put himself to the vote after years of experience as a governor, minister and vice president. Jahangiri responded harshly to Qalibaf and to hardliners more generally. “You have deprived reformists of all of their rights. You don’t even want them to have a representative in the election. I am here representing reformists to highlight what you have done with this movement,” he said. 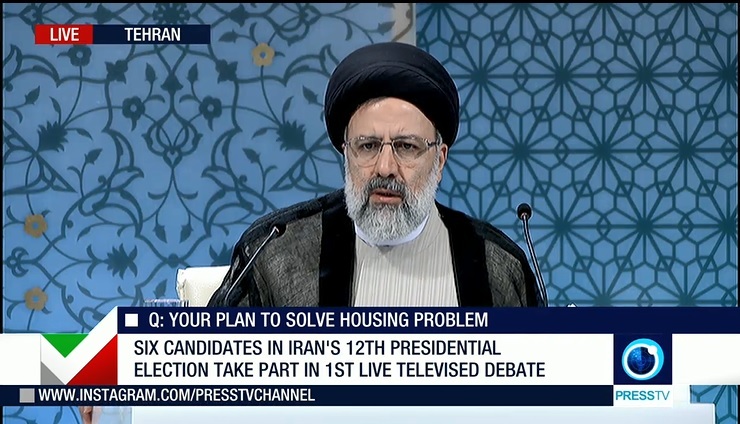 Hardliner cleric Ebrahim Raisi, performed weakly in the debate. Although he managed to stay above the fray, Raisi also came off timid. He often highlighted social problems without taking Rouhani to task and did not offer many specific solutions beyond tripling cash handouts to poor people. Raisi will need to do more to distinguish himself in the coming weeks. Unlike Rouhani and Qalibaf, he was largely unknown going into the campaign. In a national survey conducted April 11-14, some 46 respondents said they did not know him. Mostafa Hashemitaba, a former minister of heavy industries, also did not get into any serious arguments during the debate. The pro-reform candidate also did not criticize Rouhani. 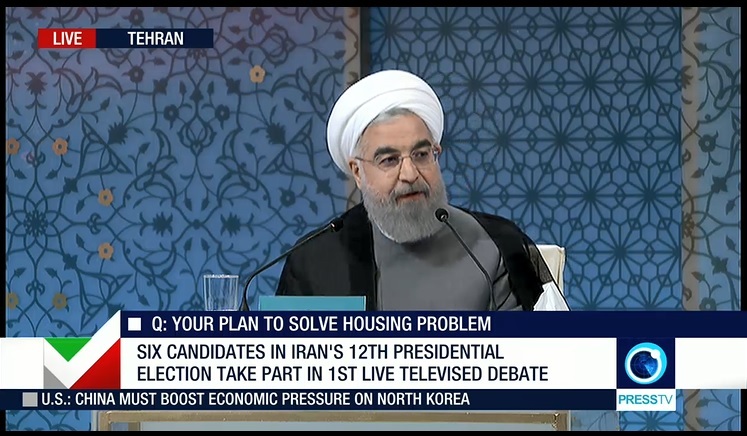 Like Rouhani, he also emphasized the need for foreign investment. Hashemitaba said two other major issues facing the country are employment and housing. Mostafa Mir-Salim, a conservative member of the Expediency Council, was among the least prepared of the three conservative candidates. The former culture minister’s main message was that Iran’s manpower is its greatest asset. He sometimes used his rebuttal time to ask the candidate at the podium additional questions or critique his opponents’ arguments. But he did not offer many of his own ideas. The following is a rundown of the candidate’s main points. The next debates will focus on economic and political issues. If Iranians want eight percent economic growth, foreign investment is necessary. Unemployment is the main obstacle to young couples getting married. The government should create an atmosphere of hope, not restriction, which will encourage young couples to marry. If it were not for the Rouhani administration, the Internet and social media would be so limited that candidates wouldn’t be able to use them for campaigning. The government has already created 700,000 jobs for women and intends to do more to promote employment, especially for university graduates. The number of government aid recipients tripled during Rouhani’s first term. The government has improved quality of life for people in western and eastern provinces with the extension of gas lines to Zahedan and the development of the Chabahar port. Some media outlets are trying to create divisions between the government and the people. Iran’s wealth gap is a result of the top 4 percent, the elites, not allowing the rest of Iranians to get involved in business. The government should increase cash payments to poorer citizens. The government is ignorant on the issue of pollution and has not implemented a plan that the Tehran municipality offered to curb it. Rouhani’s government does not have a proper strategy for combatting the environmental crisis and is not investing enough to stop it. Tehran’s municipality has taken steps to protect the environment including using garbage to generate power and produce compost and planting trees around the capital. Tripling cash subsidies to the three lowest classes and reforming the tax system would help narrow the gap between the rich and poor. Those earning less than 30 million rials, or about $800, should be exempted from income tax. Tax evasion is a key obstacle to social justice, and the government should not provide financial support to the wealthy. Newly wed couples should receive housing assistance. Unemployment and a decrease in production are contributing to socioeconomic gaps. The high number of unoccupied homes is contributing to the housing problem. Increasing housing investment funds and bank loans can help expand access to affordable housing. Providing cash subsidies to only the poor eventually, as proposed by Raisi, would drag the middle class into poverty. The government has neglected peripheral areas in Iran, causing economic, security and political problems. Correct management of water resources would reduce immigration from rural areas to cities, which can lead to social problems. Better urban planning and population distribution policies are needed to prevent increased migration to urban centers. Some 10.2 million Iranians are totally illiterate. The government and auto industry should shift their focus from private automobile manufacturing to public transportation to help tackle heavy traffic in urban centers. The status of teachers should be elevated, and the education system should be improved to help the next generation succeed. Treat addicts like patients and smugglers as criminals to solve the drug problem. An increase in bank loans and mass construction projects could help solve the housing problem. The government should prepare the ground for foreign investment. Protecting the environment is a priority, including reforming the agricultural sector. Iran can attract expatriates back by allowing them to invest in Iran and to work in Iran unconditionally.